Arizona Gov. Doug Ducey signed legislation Wednesday making Arizona the first state in the country to accept out-of-state occupational licenses. House Bill 2569 passed the House and Senate with bipartisan support. The legislation means occupational licenses obtained in other states would be acknowledged in Arizona. Proponents say the legislation will save those moving to Arizona money, since they no longer will have to pay to become relicensed once they relocate. 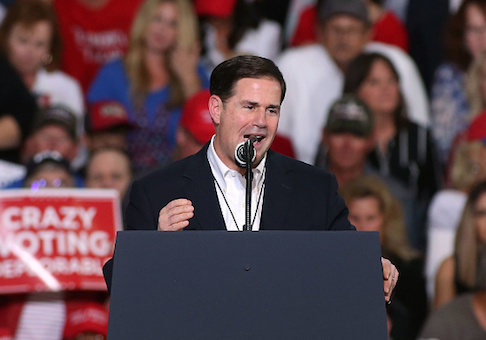 "Arizona’s economy is booming, and the people that are coming out here are just looking for an opportunity to carve their own path," Ducey said at a news conference for the bill’s signing. "Too often our government has acted as an adversary, not an ally, for people that want to work." "Today, those days are over," Ducey said. Ducey called for the plan in his January State of the State address. Arizona saw 122,000 people move to the state from 2017 to 2018, the fourth highest amount in the county, which some attribute to the state’s low unemployment rate and access to jobs. Free-market groups have praised the legislation as an innovative move that reduces barriers to work. "Legislators in capitols across the country should emulate this new bill," Steven Greenhut, a senior fellow for the R Street Institute in Washington, D.C., wrote in February. "It’s silly to prevent one state’s resident from working in another state until that person goes through an entire training process that he or she already has completed somewhere else," he added. Other states, such as Michigan, have passed licensing reciprocity laws in recent years, but they only applied to military spouses, said Jarrett Skorup, director of marketing and communications at the Mackinac Center for Public Policy in Michigan. "It’ll be interesting" to see if similar legislation catches on in other states, he said. "It’s [an issue] that a lot of the local in-state industry groups fight about."